This is the thirty-fifth in a series of posts about war tax resistance as it was reported in back issues of Gospel Herald , journal of the (Old) Mennonite Church. The Gospel Herald would cease publication as an independent magazine at the beginning of 1998 , merging with The Mennonite as the Mennonite Church merged with the General Conference Mennonite Church. Today I’ll show some of the final mentions of tax resistance in the magazine before the merger. Taxes for Life delegates present a check of diverted war taxes for health needs of low-income families to the governor’s office in Harrisburg (Pa.) on April 15 . 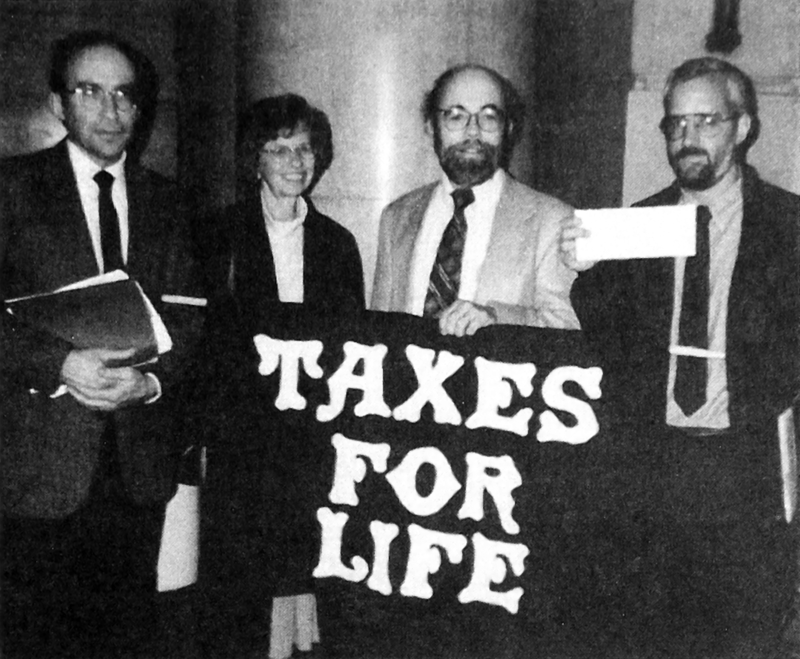 They are (left to right): Herb Myers, Annn Marie Judson, John Stoner, and Dave Schrock-Shenk. Lancaster, Pa. — On April 15 , the day U.S. income taxes are due, some Mennonites here diverted a portion of their war tax money toward health needs of unemployed persons. They presented a check of $1,000 to the office of Governor Tom Ridge in Harrisburg. The war tax objectors are part of Taxes for Life — a group that meets to support each other in seeking biblically nonviolent responses to the government’s demand for funding of war and military preparations. Governor Ridge had threatened to cut 260,000 persons off the medical assistance rolls in Pennsylvania, arguing that the money was not available in the state to cover those needs. “We wanted to demonstrate that if wasteful and destructive expenditures in military systems could be redirected, life-giving programs like health care to vulnerable citizens could be well-funded,” says member Earl Martin. Speaking to government actions. On the day following the tax witness , in a perhaps unrelated action, Governor Ridge announced his intention to compromise on his cut-back proposal. On April 14 , members of the Community Mennonite Church of Lancaster took a celebrative “second offering” in which children and adults walked forward to contribute “sympathy money” to the Taxes for Life effort. They added $575 with that spontaneous offering. Governor Ridge’s representative, after an extensive discussion of the issues with Taxes for Life representatives, received the check only to pass it on to the state treasurer’s office. Whether the state treasurer will choose to cash the check marked “diverted war tax money and contributions” remains unknown. I wonder if we often limit our nonviolent witness to refusing military enlistment. That leaves the onus for the sins of violence on military personnel. Our witness must include the invitation to military personnel to consider Jesus’ way. That witness has integrity when the rest of the church is also asking how to be nonviolent Christian citizens. Mennonites paying taxes and remaining silent about an astronomical “defense” budget are also complicit in violence. Brother Leslie Francisco Ⅲ expressed this well in Between the Rock of Peace and the Hard Place of Outreach . While no war now rages that demands our sons, people of conscience in the United States are nevertheless forced into the morally unconscionable position of underwriting the continued, unchecked growth of the largest military industrial machine in history. Mennonites have a proud and painful history of refusing to compromise on the issue of military conscription. But given that war revenues from Mennonites are enough to at least support the Army’s 82nd Airborne Division, we cannot at the same time be called uncompromising pacifists. Perhaps the state department concedes CO status to Mennonites because we still by and large hire the soldiers that fire the bullets. If Mennonites are unable to take responsibility for the use to which the state allocates revenues forcibly taken from them, then Mennonite understandings of separation of church and state must expand to organized refusal to cooperate in paying war taxes. Every Mennonite congregation should send two or three letters to their U.S. Senators voicing their concern and asking that the Peace Tax Fund bill be adopted. This bill would amend the Internal Revenue Code to provide that a taxpayer conscientiously opposed to war have tax monies spent for nonmilitary purposes. That’s the first step. [I]f angels play wonderful, life-giving jokes on the world, then I’ve seen them… They play jokes of life on the government by refusing to pay war taxes and then giving more to mission and service agencies than the government would even require for itself. Larry Hauder’s questions are worth pondering: How are we different from the world? What does it mean today to be separate? My favorite answer is that, in addition to accepting Jesus as Savior and Lord, we believe in a lifestyle of peace and nonviolence. Yet that’s hard to make visible when our country is not involved in a major war. Those who try to do so through such means as refusing to pay “war taxes” we generally dismiss as too zealous in making discipleship practical. The 8 Oct. 1996 issue reprinted from The Mennonite a news brief about the IRS seizure of the home of war tax resisters Elizabeth Gravalos and Art Harvey. …comfortable North American churches aren’t growing while persecuted churches in other countries are. How do we “stand alongside [the poor, the dispossessed, and the outcasts]”? Some of us have answered by withholding our war taxes. Others have joined Christian Peacemaker Teams. Some sell or give away their possessions and live in community. Others go into dangerous parts of the world and attempt reconciliation. Yet these are mainly individual acts. For the most part, we as a total church have not been able to agree even on these relatively simple attempts toward faithfulness. Can a non-persecuted, comfortable church also be a growing, faithful church? The record has not been good. In Mennonite history, we have the examples of churches in Russia and Europe, where, as Christians grew wealthy and accepted, their message became diluted and weak. Even in the New Testament we read much more about the “mission outposts” that were being questioned and oppressed than we do about the more wealthy and better-accepted mother church in Jerusalem. A faithful church that’s not persecuted? God just may be giving North American Mennonites another chance to see if that’s possible. We are the best-read, most-educated, and probably the wealthiest Mennonites who ever lived. Can we catch a vision to channel that knowledge and wealth into living and proclaiming the gospel rather than in spending the majority of it on ourselves? We… try to legally avoid federal taxes because of the large portion which supports the military. We have some tax breaks that many others do not have because John is an ordained minister. But, as a matter of principle, to legally avoid taxes, we have placed our savings in tax-free investments, tax-sheltered Individual Retirement Accounts, and similar 401K instruments. These savings, with tax-free compounding, have grown to $200,000 — by saving 15 percent of our annual income with interest compounding at an average rate of 6 percent over the years. London, England — Supporters of peace tax campaigns and war tax resistance from 16 countries met here, Nov. 29–Dec. 1 , to discuss the progress and importance of working corporately toward a peace tax law. Three American Mennonites attended the conference that was hosted by British members of the Peace Tax Campaign: Marian Franz, director of the National Campaign for a Peace Tax Fund; Cesar Flores, member of the Honduran Mennonite Church, and Susan Balzer, administration committee member of the National War Tax Resistance Coordinating Committee. Speakers reported on the peace tax legislation proposals in various countries and expressed the belief that if one country passes a peace tax bill, other countries would soon follow. In 1972 , the United States became the first country to initiate peace tax bill proposals. Current lobbying efforts are geared toward making the bill’s passage a religious freedom issue. In addition to observing Prisoners for Peace Day and honoring those who have been imprisoned for conscientious objection, conference participants attended workshops on war tax resistance issues. How can I work for peace if I pay for war? Is paying for soldiers to murder less evil than pulling the trigger myself? Millions of Vietnamese, Cambodians, Laotians, Japanese, Salvadorans, Iraquis, Koreans, and Germans begged their gods to protect them as U.S. bombers destroyed their homes and crops and massacred their families. Some of the victims prayed to Jesus. All this happened while Christians in the United States paid taxes to build and fly the U.S. bombers and sang every Sunday about God’s love for all people. Half of every federal income tax dollar goes for war — past, present, and future. Tax dollars are the lifeblood of the military beast devouring the world’s poor. In order for the U.S. or any other empire to plunder and to massacre, two things are required from many citizens — silence and paying taxes. For 18 years I have paid no federal income tax by living under the taxable income level, and I also am not silent. I prize living the truth as best I see it far more than unnecessary material possessions. I say — not with my money, not with my silence, not in my name! “If you really care about not supporting the military with your taxes, use the full charitable donations deduction allowed,” the speaker in our young adult Sunday school class challenged. We could deduct up to 20 percent of our income for charity. Twenty percent — the figure echoed in my thoughts. My husband-to-be, George, and I had chosen to follow parental patterns of tithing 10 percent and giving gifts above and beyond. I knew no one who gave even close to 20 percent. Yet I certainly cared deeply about using my money for life-giving purposes rather than for building up an arsenal of destruction. Was George stirred as I was? Through discussion, George and I soon reached agreement. We would move toward the goal of giving 20 percent. Thus began a joyful journey of stewardship as a married couple. In the first year of marriage, we inched toward our goal. We used bicycles while saving for a car. George continued graduate studies while I started my first full-time job. Within four years, we had a fuel-efficient car and our first child. We had managed to reach 15 percent in donations. Even though I stayed home with our infant and we had a tight budget, we were able to eat good, nutritious food, continue with retirement savings, and buy the things most important to us. When George finished school, we moved to the United States for a job. We moved at the right time — housing prices had soared in our area, and we sold our small condominium for several times the price George paid a decade before. Our household income increased dramatically. We had major stewardship decisions to make. Initially, I felt disoriented in the new economic terrain. Reducing our military taxes continued to be a high priority for us. Since interest from mortgage payments is tax deductible, we invested in a spacious house on a wooded lot. We committed to making our home an open place for those who needed a place of retreat from the stresses of human services, overseas work, or ministry. Buying the house reduced the need for other stewardship decisions; after donations, mortgage, taxes, and utilities, our budget was more generous but not radically different from student days. By the time our second child was born, we had nearly reached our goal of 20 percent donations. We started catching up to our goals for university savings for our young ones. Martin Shupack asserts that the federal government, while sometimes a “violent rebel,” can be an instrument for good when used for such causes as welfare for the poor, Medicare, Social Security, and other social programs designed to help those in need (“Violent Rebel or Valuable Servant,” Nov. 11 ). What Shupack does not seem to realize is that all government programs are the products of violence, regardless of who benefits from them. Taxes can be collected only if the government backs up its taxation policies with violence and threats thereof. The question, then, is this: are Mennonites absolutely for peace and against the initiation of force? Or is the taking of money by means of violent coercion acceptable when the money will be spent on causes they regard as worthwhile? If the Mennonite Church is to be consistent in its opposition to the use of force, it must be opposed to it in all forms — including the form of taxation.